Please refer to our stock # W-JO11 when inquiring. 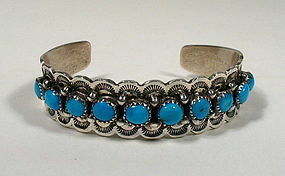 DESCRIPTION: A stunning Navajo sterling silver Bisbee blue turquoise cuff bracelet by Navajo silver artist, Henry Davis. Ten heavenly blue cabochons are set between silver beads and scalloped silver edges which are stamped in a sunburst design. This is a truly beautiful bracelet, very wearable, and in perfect condition with no chipped stones. The inside is hallmarked "HD" and stamped "Sterling." If you desire a bracelet with matching necklace, see the last two photos where this bracelet is shown with our necklace #W-JO12. Although crafted by different artists, they are a beautiful marriage with similar sized stones and the same beautiful Bisbee blue color. DIMENSIONS: Weight is 1.25 oz. (35g); wrist size is 6 3/8" including opening (size is adult, medium).